The product has been added to your basket. Click on 'View your Basket' to see your full basket. How long will it take to receive my first magazine? Whether you're a part-time amateur or a full-time pro, Digital Photographer aims to challenge and motivate you to take your best shots. Digital Photographer’s FileSilo is a rapidly growing library that’s updated continually with cool resources. Secure online access makes it easy to keep your downloads organised, plus you can browse and access the content from anywhere, whether you’re a print or digital subscriber.Buy a single copy or subscription to Digital Photographer magazine. Order before 2pm Mon-Fri for same day dispatch by Royal Mail 1st Class. All prices shown include postage and packaging. 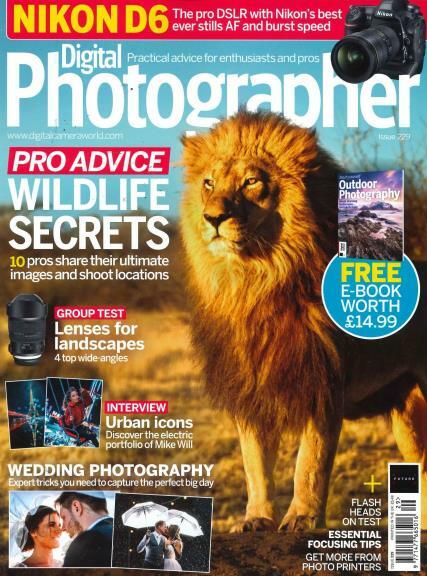 Regular features cover all the key kit and techniques, and you’ll learn new tricks and fine-tune your skills with practical photography advice and tips from top professionals. PLUS: as a subscriber to Digital Photographer, you have access to hundreds of creative resources via FileSilo - all for free! You’ll find brushes, textures, filters, actions, fonts, stock images, Photoshop assets, video tutorials and more. Shooting skills: Discover how to take standout shots with guides from the experts on landscapes, portraits, macro, astrophotography and more. Editing tricks: Make your shots the best they can be with step-by-step guides to image enhancements, including retouching and creative effects. Professional insight: Be inspired by the world’s top pros as they tell you how they built their careers, their top shooting advice and the stories behind their famous shots. Career advice: Learn top tricks for making it in the photographic industry and how to start earning money from your shots. Kit reviews: The latest and greatest cameras, accessories and software rated by tech experts. Impartial advice guaranteed so you make the right choice for your next purchase. News & First looks: We share with you hands-on previews of newly released must-have kit, as well as keeping you up to date with the latest trends, competitions and more. Follow us through our social networking. ©Copyright Unique Magazines 2019 All rights reserved. VAT Number 828958664. Unique Magazines Limited is a company registered in England and Wales. Company Number 04842207.